Pokemon ParadijsHello, I’m back with my miniature deck feature series in the post Next Destinies meta. The first article in the series, TyRam, is located here. Now, I’ve been looking at the front page articles over the last little while. One thing has stood out to me, there has not been a proper Durant deck analysis. There is one article about playing against Durant. Durant has a little section in this article. But, there is not a dedicated article. So, let’s get to it. Let’s get to the core structure of the deck. That sets the core requirements of the deck at 31-40. This deck is one of the most flexible decks out there. Let’s talk about what cards can fill the core requirements. Three cards can fill this role now. Pokémon Collector: Collector lets you search for three Basic Pokémon and put them in your hand. Given that all the Pokémon in this deck are Basics, Collector is a great play. The only downside to this card is that it is a Supporter. Due to that, you cannot play another Supporter the same turn you play this. Dual Ball: This Item card allows you to flip two coins. Then for each heads, you get to search for a Basic Pokémon and put it into your hand. We have a love/hate relationship with this card. It is great because it is an Item. That means that you can play multiple copies per turn and you can still play your Supporter for that turn. However, there are those pesky flips. There is always the chance of you hitting double tails when you desperately need another Pokémon. Level Ball: All of the core Pokémon in this deck have less than 90 HP. So, this Item card is excellent. It allows you to search you deck for a Pokémon with 90 HP or less and put it into your hand. That is great because it is an Item and has the same advantages as Dual Ball. 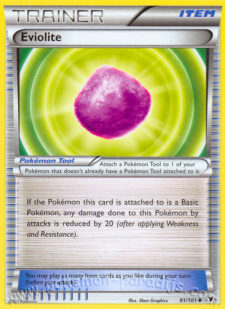 Even though you can are limited at one Pokémon for this card, the one Pokémon is guaranteed. 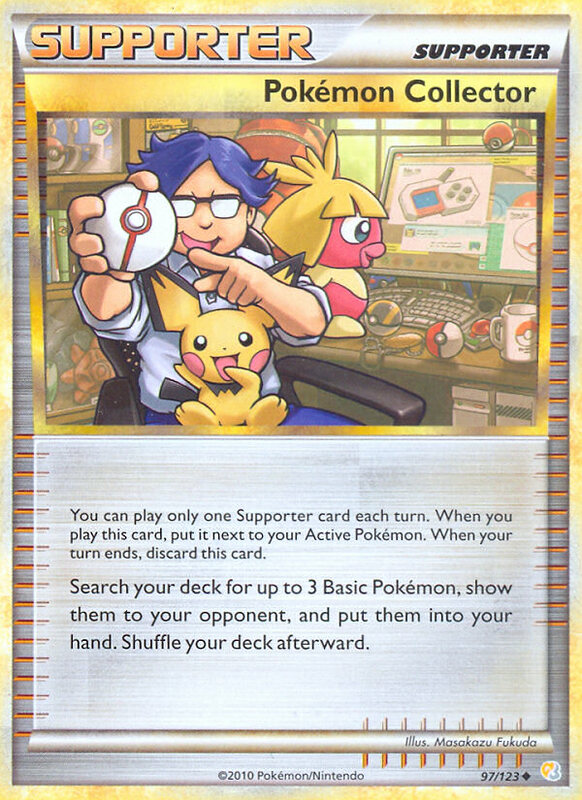 What is the play: Well, I absolutely love the consistency of Pokémon Collector and there is not a stronger play for the deck (or almost any deck) than a turn one Collector. Secondly, I absolutely love the guarantee that Level Ball brings. In light of those considerations, I go with 7 Pokémon search cards: 4 Collector and 3 Level Ball. These are normally referred to as the engine of a deck. They are what keep the deck moving. Here are the cards that can be played. Twins: This card allows you to search your deck for any two cards and put those cards into your hand. The catch is that you must be behind in prizes. Well, that is very good in a deck that does not aim to take prizes. N: This card makes both you and your opponent to shuffle your hands into the deck and then draw as many cards as you have prizes left. That means you will almost always be drawing 6 cards and your opponent will be drawing less. This card seems to be a great fit for Durant. However, your opponent will likely be hoarding cards in his hand. When you play this at the end of the game, you are letting your opponent shuffle a lot of cards back into his deck. It can buy your opponent another turn or two. 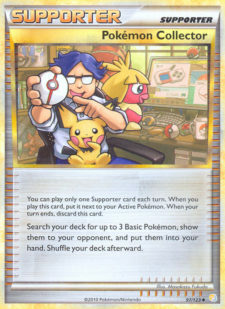 Professor Oak’s New Theory: This card allows you to shuffle your hand back into your deck and draw six cards. It is pretty vanilla and a great choice. Professor Juniper: This card allows you to discard your hand and draw seven new cards. It digs a little deeper than Professor Oak’s New Theory, but is also burns through resources. Victory Medal: If you are fortunate enough to have this card, it is a decent choice. It allows you to flip two coins. If one is heads, you get to draw a card. If both are heads you get to search your deck for any single card. Pokégear 3.: This is the Swiss army knife card. 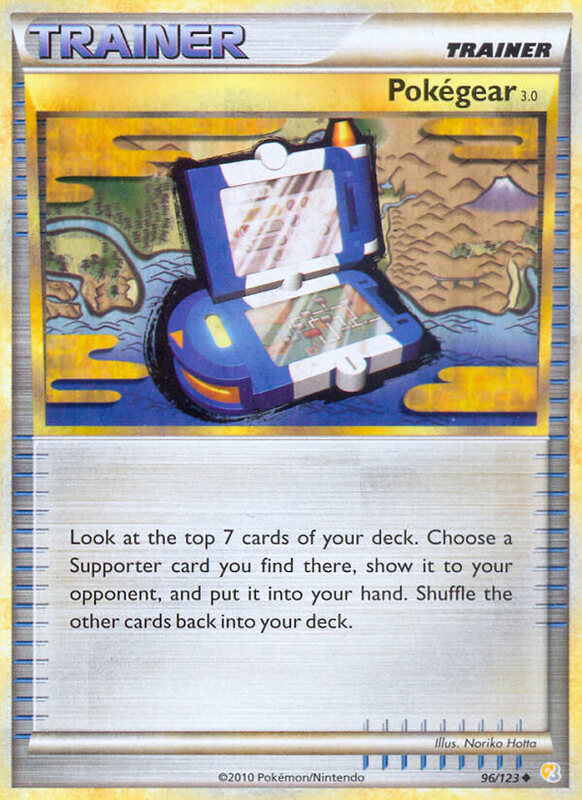 It allows you to look at the top 7 cards of your deck, pick any Supporter in those cards, and put that Supporter in your hand. This is a great card to help with the turn one Collectors. It can also be reused with Junk Arm. What is the play: There are several things to consider here. The main questions to consider is how many other Durant decks will you play against. This is a huge factor in the selection of cards. If you are playing against a lot of other Durants, Twins becomes less viable, Professor Juniper becomes less desirable, and Professor Oak’s New Theory becomes huge. In a meta with a lot of Durant around, here is what I would play: 2 Professor Juniper, 4 Professor Oak’s New Theory, 3 N, 3 Twins, 2 Pokégear 3.. In a meta with less Durant and more “traditional decks,” here is what I would play: 4 Twins, 3 Professor Oak’s New Theory, 3 Professor Juniper, 2 N, 2 Pokégear 3.. This makes 34 cards. We still have 26 slots to fill. There are generally three other broad categories that can be used to fill these slots: recovery, game state disruption, alternative attacks. There are several recovery options here. Revive: This is the most simple recovery card out there. It lets you search your discard for a basic Pokémon and put it on your bench. By early to mid game, Durants will likely be OHKO’d. Revive is the optimal card to get those ants back. 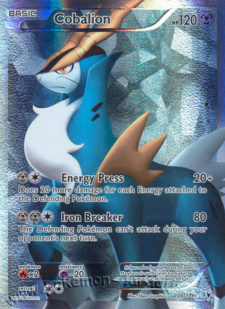 The main weakness to this card is that it is worthless against trainer lock decks. Super Rod: This card lets you take any combination of three Pokémon and Basic Energy from your discard and put them into your deck. This works really well with the Pokémon search cards. Flower Shop Lady: The main draw of this card is that it is a Supporter. 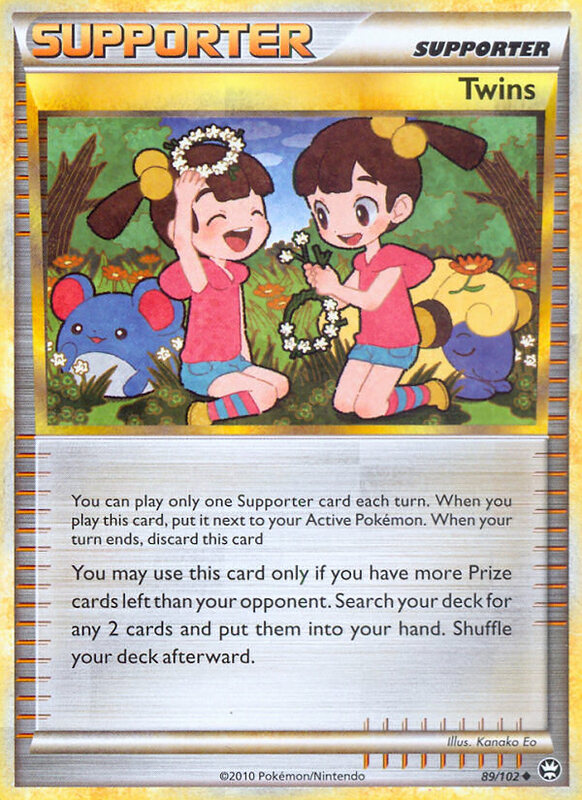 If there are a lot of Trainer lock decks in your area, this card can keep you in the game. It allows you to take three Pokémon and three Basic Energy and shuffle them into the deck. This card also helps a lot in the mirror match. Rescue Energy: In general, this is not a good inclusion because you want to use only relevant energy (with regards to attack costs). However, it works against Trainer lock. What is the play: I like the simplicity of Revive. I also like the power of Super Rod to help with energy droughts. Based on those, I play: 4 Revive and 1 Super Rod. What do I mean by game state disruption? I mean these are cards that mess with the state of the board. They might move Pokémon around or they might move energy around. Let’s look at some of the cards that can in this deck. 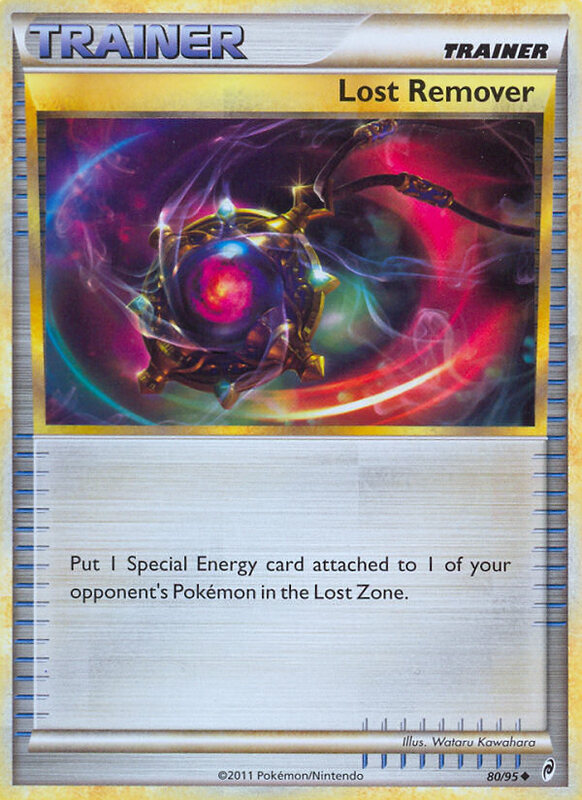 Lost Remover: This card allows you to select one Special Energy on the field and send it to the Lost Zone. We have already seen this card rise in popularity because decks like 6C and CoKE run a lot of Special Energy. Well, with practically all decks running EX Pokémon and those Pokémon needing Double Colorless Energy to function, Lost Remover becomes even more potent. This card will be included in the deck. 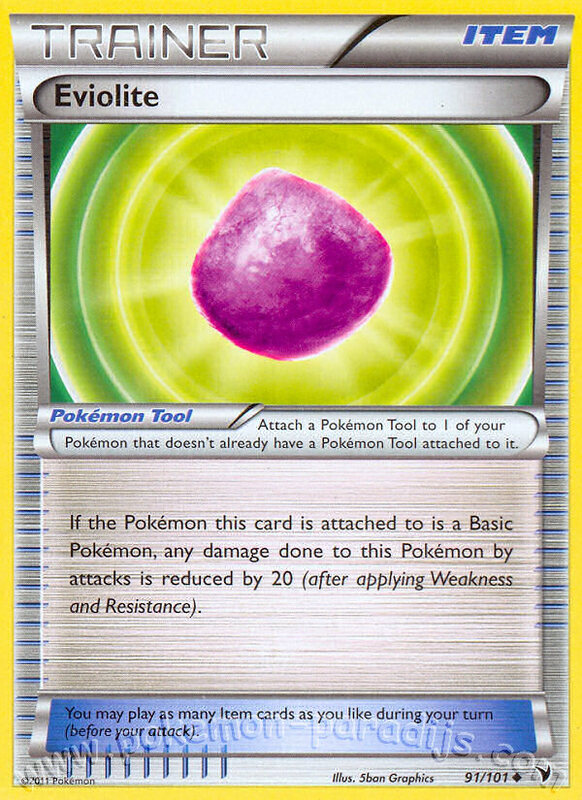 Crushing Hammer: This card allows you to flip a coin, if head you get to discard an energy attached to your opponent’s Pokémon. This is great for targeting Basic Energy. It does rely on a flip though. Pokémon Catcher: This card allows you to switch your opponent’s active Pokémon with one of his benched Pokémon. It is great for dragging up a Pokémon with no energy attached and a big retreat cost. Switch: This is the anti-Catcher. It is also the only defensive card on the list. 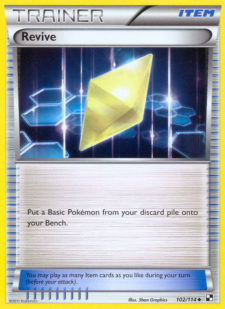 Your opponent may try to drag up a benched Pokémon with no energy to stall you out. Switch allows you to get out of those undesirable situations. Ditto TM: With the new Heatmor not being in Next Destinies, one of the best counters to Durant is V-Create Victini. You can play Ditto and limit your opponent’s bench space to four, then Victini cannot attack. Seeker: One prevalent strategy to combat Durant is to play down one attacker. However, many times your opponent will not start with the one attacker he desires. If you opponent has two Pokémon on the field, you can Catcher the benched Pokémon and then Seeker up their attacker. It’s a fun trick. What is the play: Special Energy are going to continue to rise in popularity. Basic Energy still has to be dealt with. There are plenty of Pokémon with high retreat costs to target with Catcher, but many people are running Switch and maybe Skyarrow Bridge to make the drag and stall tactic less appealing. Cobalion NVI: This is the main alternative attacker for most people in Durant. It is resistant to Mewtwo EX. It can force many of the big retreat Pokémon to be stuck in the active. For MC it can do 20 + 20 for each energy attached to the defending Pokémon. Or for MMC it does 80 and the defending Pokémon cannot attack. If you do decided to play Cobalion, you should look into playing Exp. Share. 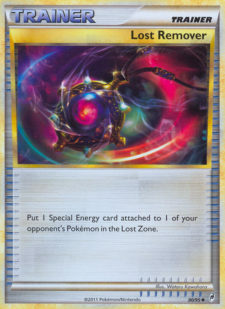 Prism Energy: Why is this card in this section? Well, the deck runs Rotom to get Durants out of the prizes. However, Rotom can also attack with Plasma Arrow. For L, Rotom deals 20 damage times the number of energy on your opponent’s Pokémon. This means that you can attack and KO Zekrom after two Bolt Strikes. You can do at least 80 to most EXs (setting up a two or three turn KO). It is always useful to have and energy to run for Plasma Arrow. Black Belt: Black Belt is a Supporter that adds 40 damage to your Pokémon’s attacks when you are behind on prizes. This means that you can often set up a surprise Vice Grip for 70 damage. That could be enough to spring a surprise KO on stuff like Victini. Smoochum HS: This little baby allows you to move your opponent’s energy around. If your opponent placed two Pokémon on the field, you can push the energy off one Pokémon onto another and then Catcher that one to stall. Mime Jr. CL: This baby allows you to mill one card from your opponent’s deck and send it to the Lost Zone. It used to be considered a good starter for the deck. Now, it is something to likely pass up. What is the play: I personally run 2 Prism Energy and 1 Black Belt. That brings the list up to 51 cards. We still have 8 slots to fill. 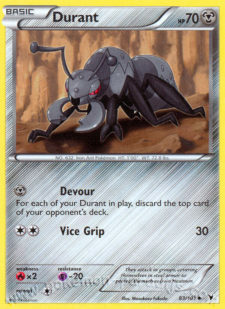 There are two cards that we have not talked about two staple cards in Durant. Junk Arm: This cards allows you to discard two cards in your hand to retrieve one Item card from the discard. This card allows you to effectively have four more of any Item card in your deck. Running four copies is a near must in Durant. Eviolite: With Durant you need to delay your opponent from taking prizes as much as possible. Eviolite is the exact card to accomplish this. A Durant with Eviolite and Special Metal Energy has an effective health of 100 HP. While there are certainly cards that can swing for 100 every turn, few cards can accomplish this without a support Pokémon set up. I play three Eviolites. RomeertThat brings the list up to 58 cards. Thus, you have two slots to fill in. Those two slots can make or break a good Durant list. I would recommend looking into thicker lines of the pre-existing list. Possibly 2 more Eviolite, another Switch, 2 more Pokégear 3., and one more Level Ball. But, ultimately those slots are up to you. Again, I am not going to go into great matchup details. We do not have a solid defined meta yet. 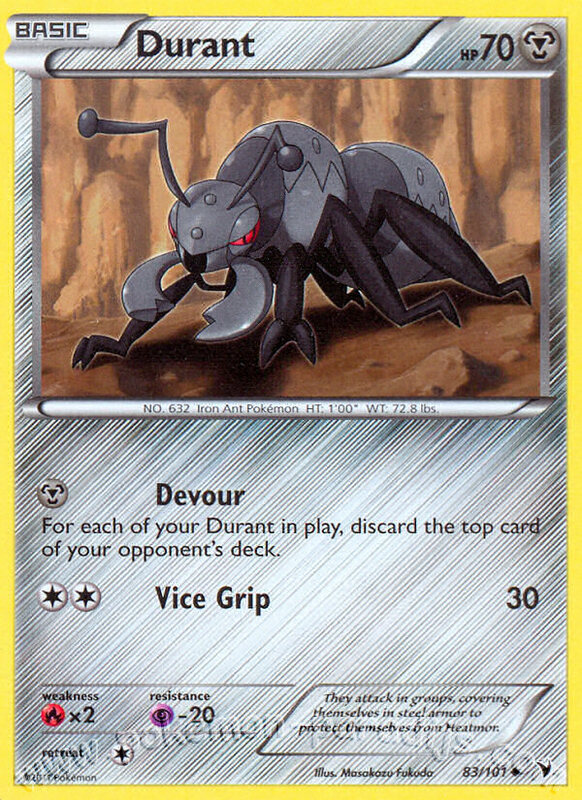 I will say that Durant id very good to solid against Mewtwo EX bases decks (looking at you CMT), Magnezone decks, 6C, and The Truth. I hope you have enjoyed this second deck analysis article. I hope that it has given you something to think about. In summary, Durant is a great deck with solid matchups. It is also extremely cheap (a huge bonus). It will be a serious player for States. Sorry. I messed up the links. I put them under the tyram sentence. They are supposed to be about durant. Skyarrow Bridge is a double edged sword for Durant decks. Yes it helps you when your Durants with no energy or your Rotom are catchered out, but it also helps your opponent as well and that’s something you don’t want to do. You WANT catcher to be disruptive. I think you misunderstood me. I was saying that other people playing SkyArrow Bridge is a bad thing and that in order to knock out bridges your opponents might play, the battle city promo could be an effective card in Durant decks. I was thinking about running 1 copy of Pokemon Center just to counter Skyarrow Bridge. I also run Alph Lithograph 4 to make sure my Rotom gets prized durants as soon as possible. 6 slots left but those should be in the skeleton at the very least…. Sorry about that. I just messed up the copy and paste for the final list. If you read the text of the article I say to play 4. My apologies. I’ll see if I can get that edited. ah yes – i see you have read the article very well. Revive and Super Rod are clearly mentioned but it looks like they have just been left out of the lists by mistake. why run black belt. is it jsut for rotom? yeah for rotom clucthing due to a N one turn? next turn a black belt and a prism for the win? you can Rotom or Vice Grip with Blackbelt for 70+ damage. It opens ups the possibility to KO some stuff. This will be especially true when Heatmor comes out. You could Rotom for 20 then on the next turn Vice Grip for 70. Just an idea. It is definitely not required. Any stadium would be effective for taking out Skyarrow Bridge. I guess I should have mentioned them. As for Battle City helping you mill them, no one will fall for that. The problem is that only 6C and CMT will use Skyarrow Bridge as a staple. Durant already takes out both decks pretty easily. So, is it necessary to tech a stadium to increase an already favorable match up? Also, they will likely be running 3-4 Skyarrow Bridge. So, even if you take it out there is a strong likelihood they will get it back relatively quickly. I just personally feel that stadiums are not needed in Durant. That does not excuse me not talking about them. Yeah, any stadium can counter Skyarrow. As people below say, Battle City is likely the better choice. IMHO, I do not feel that it is necessary to counter. CMT and 6C are the decks that will rely on Skyarrow Bridge. Durant already takes those decks out. So, why use a slot to counter a deck you are already good against. AL 4 got a ton of play in Durant ideas. Most people ended up ignoring it. First, only running 1 does not give you a solid chance of having it when you need it. Second, running 1 makes there be a decent risk it will be prized. Third, running more than 1 takes away from more important stuff in the deck. For those reasons, I feel it is not a needed card. in your final list, you have 3 eviolite, but you say for the final 6 slots, you would put in 2 more. 3+2 does not equal the cap of 4. This is the sort of article we should have in the UG, instead of these survey articles with half a dozen untested deck lists, all with superficial analysis. I vote for the Hawk in UG. I do like Battle City in Durant. Gives you a 50-50 shot at fishing something out of your Prizes every turn when you use it with Rotom. I remember back when I first built Gyarados I played 5 SSU. I found 3 to be a better play. Surprised Cheerleader’s Cheer wasn’t mentioned in the Draw Supporters. It’s tempting. Overall, a superb article. I’ve been hoping for a durant article for a while. Especially one on how to play durant properly, but that’s a hard one to write about. There shouldn’t be anything less than 4 crushing hammer, IMO. It’s what usually get you the win. Also, as much as I expect special energy to be big, IMO 4 is a little overkill; 3 sounds like a better number. Just an opinion. On catcher, this is debatable. Most decks don’t run more than two switches, and usually at least one will be milled away. Also, I love the idea of having my opponent use junk arm for switches instead of super rod. As such, I still believe that at least 3 catcher is good play. I like to be safe an include a counter stadium just in case. Battle City is the best hands down, because it helps you while still messing with your opponent, lol. It’s also a free draw per turn, never a bad thing, ya? The few times I tested it, it’s funny, but my opponent do sometimes use it for that lucky topdeck. Regarding rescue energy, it also functions as a free revive. I like how I don’t have to waste resources like junk arm or twins just to refill my ant hill. Lastly, this is opinionated, but I feel that 3 twins is enough no matter the meta. 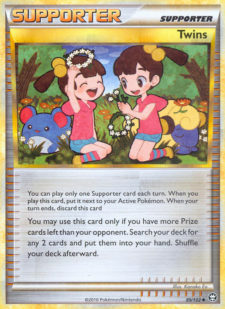 What with all your other draw supporters and your burning of trainers, you often need to dig deep into your deck, and while without guarantee, the other supporters will more often than not draw more needed cards than twins. I love search, but PONT and juniper gets me out of tight spots better than twins. You are the ONLY author on Six Prizes that makes me consider subscribing. Your articles always impress me, and I would be utterly disappointed if you got a much-deserved bump to UG. Also, you <3 TyRam, as do I! I am surprised this only got a +9. This was a really nice article. One thing I think some of the six prizes community is doing is seeing these articles on decks they are not fond of and thinking, “Oh I don’t like that deck so I won’t give this article a thumbs” or, “Durant isn’t spirit of the game. Thumbs down!” without even reading it. I’m not hating or anything. I just feel like pointing it out might help realize what they are doing. I think you are one the money about the number of likes. When people don’t like the subject matter, they either don’t vote or down vote. I’m not too worried though. It’s not that big of a deal. btw i am loving durant in my testing.. I am using Team Rocket’s Trickery as a draw card, you only get 2 cards but it makes you opponent discard a card from their hand. Anytime you get a card into the discard it is a bonus for this deck. A very nice article. How many mulligans have you usually got? Is a viable strategy play 4xN or 2xN & 2xjudge to cut your opponents big hand after several mulligans?